Solution: How To Recover Data From Crashed Hard Drive ? Home > Hard Drives > How To Recover Data From Crashed Hard Drive? Hard drive crash is nothing less than a nerve-racking event. It can happen to anyone and due to many reasons such as the head crash, poor hardware quality, improper ventilation, fault in the CPU, power surges, virus attacks, accidental deletion/corruption, and human errors. Whether caused by a hardware or a software failure, either way, the loss will be yours. Your hard drive can fail due to many reasons but trying to open it on your own can land you in trouble. Also, Mishandling the crashed hard drive can make the hard drive data recovery tedious and could cost you more money to recover data. What not to do when Hard Drive Crashes? Do not restart your computer under any circumstances. Quickly turn off the system rather than reactivating it in case the hard drive connected has crashed. Avoid normal place to open hard drive as it reduces the chances of recovering data. Do not trust the ‘online myths’ like ‘putting the crashed drive into the freezer’ etc. It will only make the damage irreversible and cause permanent data loss. Your hard drive can fail due to many reasons but trying to open it on your own can land you in trouble. Mishandling the crashed hard drive or using any unauthorized software can make the data recovery tedious. Professional data recovery service provider charge more to recover data from an already opened drive. What to do when Hard Drive Crashes? Due to it’s moving parts hard drives are very different from memory cards, SD cards that are easy to deal with. It can’t be easily internally affected, for the most part, they suffer physical damage. From clicking to the clattering whenever you hear such sounds, be sure that your hard disk is physically damaged. And there are higher chances of losing the data. As for the logical damage that occurs due to malware attack, corruption or formatting, or accidental deletion of the data, you can rely on Stellar Data Recovery Software to recover the lost data. In case of physical damage, consulting a data recovery specialist is a great idea. With that said, crashed hard drives are subjected to more damage that may lead to fatal consequences. Thus, it is highly recommended that you rush to a specialist rather than opening the hard drive on your own if your data is critical. A Class 100 Clean Room is the necessary environment for opening physically damaged hard drives. 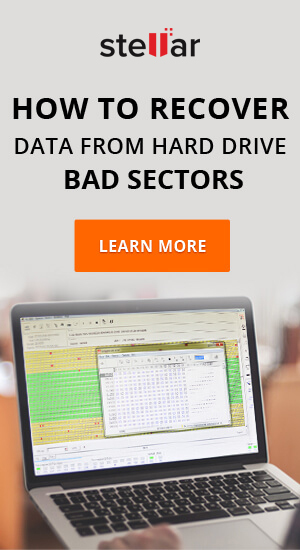 Why Trust Stellar Data Recovery Services? If you look forward to the most reliable ways to recover data, then try Stellar services. Trusted by 2 million+ customers worldwide, we at Stellar, aim at putting a real soul in any hard drive whether internal or external. You can take out the hard drive from your computer, but you must not try to open it to avoid the irreversible damage. As well, since data still exists on a crashed hard drive until it is overwritten, as a user, you have to be considerate enough before making a move. Data recovery from crashed hard drives is quite a job and can’t be attended to at home. You have to hand over your hard drive to an expert to recover your lost data. It has a customer-oriented approach that recommends you good practices and tips to avoid data loss scenarios. Boasts of skilled engineers and humongous inventory, with cutting-edge technology to ensure the great result. Recovers data quickly, efficiently, and offers a free consultation. Offers no recovery no charge policy. 100% safe, secure and private data recovery. Data loss could be excruciating especially if you don’t have a backup. So, it’s advisable to keep back up of your data on a regular basis. Stellar Data Recovery offers Data Recovery Software and Professional Data Recovery Services to recover files from a crashed hard drive. You get only one chance to recover your lost data, so ensure you choose the best available “Stellar” option. How to recover data from 2TB external hard drive?